I was shocked to see another pic of Nicki Minaj’s super long natural hair. lol She says she will wear it out when it touches her a$$ lol…It’s almost there!! But I feel like her wigs/weaves aren’t even as long as her actual hair. 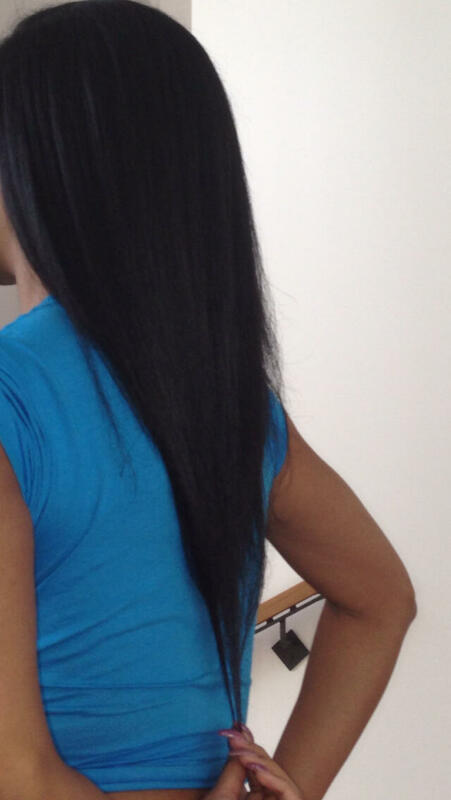 Once again, this proves that wearing weaves keeps your hair so protected that you retain more length. I truly do that believe that. If you do protective styles AND take care of your hair underneath, your hair can flourish. But you have to give your hair a break!!! Nicki used to do alot of wigs so her hair was protected…and I’m sure her past stylist and current stylist are making sure her actual hair is well taken care of. ( I interviewed her new stylist Oscar James last year. Check out the interview here for his styling tips with Clear Ultra Shea) It’s a misconception that people who wear wigs and weaves don’t have any hair. These celebs are proving everyone wrong left and right! Loving the length!!! I can’t wait to get my Nicki length!!!! Protective Stylin’ Here I Come!!! Did you expect Nicki to have such long hair underneath all the wigs and weaves?